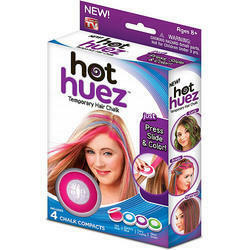 Hot Huez Hair Chalk is the hot new hair craze that allows you to instantly change your look with eye-popping color!!! Hot Huez Hair Chalk is fast^ easy and washes right out with your shampoo. So whether it''s for a rocking day or a special night^ Hot Huez Hair Chalk is instant glamorous fun just for you. Matching up with the ever increasing requirements of the customers, we are engaged in providing Hot Huez Hair Chalk. Burgundy, Golden Brown and Mahogany shades are fashion colors, which fit well with the ongoing fashion trends. These colors give trendy look and are used by people who want a complete difference in their looks and personality. Blue Ocean Impex (P) Ltd.